The shooting in Arizona is tragic. But at this time, the facts are still coming in, and there is other news going on at the same time that needs attention. One of those news stories is the impact of the man who structured the Defend Ohio rally up in Columbus to protest John Kasich’s position on organized labor is a Socialist! If these people weren’t so dangerous, in trying to compete legitimately in the battlefield of ideas, I might just pat them on the head and encourage them to keep learning and trying. But, as I’ve discussed on this forum many times and in many ways, socialism, communism, progressivism, imperialism, and on and on, are infantile mutterings of the lazy, collective oriented that lack true courage, because they seek to hide their ambition behind a government entity that they wish to use as a bargaining chip. I have news for those childish minds. The country was built on capitalist principles. Not socialist principles and unions. In fact, the growth of our nation has stopped since socialist started penetrating our political culture and used the aspects of American Culture we collectively feel guilty about, like slavery, like our treatment of women, and the handling of the poor, to manipulate the political spectrum in a way that has made the United States less competitive. For people who believe such things, their minds are like shallow streams and their recollections of American History are just as deep. American History may only be as deep as a mighty river, but there is much more under the surface that makes up the contents of the river. America is not just simple poor against rich, working man against the white-collar man, black against white, men against women, its swirls of all those things and a lot more to add. Such duality in thinking is only useful to small-minded souls that can’t see beyond their individual cages. When I heard the interview above on Doc Thompson’s show, I thought the man from Defend Ohio was naive, but well-intentioned, and I had figured he just needed to think things through a lot deeper. But now I know after a little research, that the people behind this rally are socialists! No wonder they don’t like Kasich! Before 2010, I thought communists and socialists in our American society was something that was attempted during the McCarthy era, and even then, I actually thought that McCarthy was far-reaching in his pursuit to weed out communists. I thought that because I believed what the media told me, that Joseph McCarthy was a right-winged-paranoid-do-gooder. I started to question the media when I saw that they used the same approach to attack Kenneth Star, when he investigated Bill Clinton. Star was just doing his job. Clinton had flat-out lied in federal court. It happened right in front of our faces, so that made me question the reporting of the socialists in the McCarthy hearings. Now, the evidence is everywhere. Socialists have their own party. They try to put up candidates, they have infiltrated unions, newspapers, television, Hollywood, publishing. They are a legitimate competitor for political ideas and they have done it under the radar. 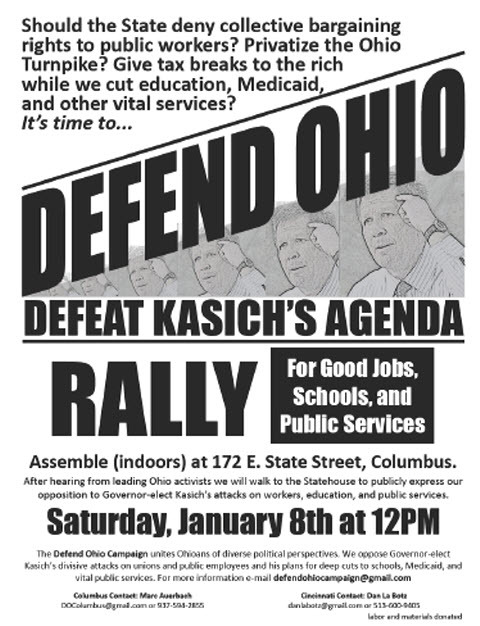 So now they have met at the capital of Ohio on January 8, 2011 to protest a Governor that is trying to bring capitalism oriented ideas back to a state to attempt to save that great state from the damage done by socialist that have infiltrated the political culture for decades. The difference between now, and when they originally started, is it’s out in the open who and what they are. And America has to make the decision about what they want to do about it. It’s ok to be wrong. And socialist are out-of-their-minds wrong. But it’s not OK to wreck American Culture to pursue the infant diatribes of half-baked minds. Now, to understand what is behind Defend Ohio, read this article. I put it up here so it doesn’t disappear after this rally turns out embarrassing for the organizers. The labor and movement activists from cities throughout Ohio created the Buckeye Socialist Network (there will soon be a BuckeyeSocialist.org website). The Network’s first campaign is called DEFEND OHIO and will focus on defending public employees’ jobs and public services. 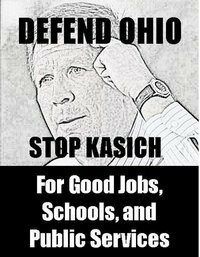 “Kasich,” said La Botz, “pledged to revoke the union organizing rights of home care and child care workers in Ohio. This is a vicious and despicable attack on the some of the state’s hardest working and lowest paid workers. And it is not so different from President Obama’s recent promise to freeze the wages of Federal employees. These attacks on public employees parallel the private employers drive for two-tier labor contracts intended to lower wages and they parallel attacks on social programs for low-income people in our society. Union members from the Teamsters, American Federation of State, County and Municipal Employees, American Federation of Government Employees, Communication Workers of America, and United Food and Commercial Workers were among those in attendance at the founding meeting of the Buckeye Socialist Network. Representatives from Cleveland, Columbus, Cincinnati, Dayton/Yellow Springs, Canton, and New Philadelphia attended the half-day meeting. Hey, you can’t make this stuff up. Progress Ohio has their name all over this. These “types” of people are in the minority, but because they are motivated radicals, they must be dealt with equal passion from those of us that think correctly. And yes, there is a correct way to think and an incorrect way to think. Individuality and the power of the individual are correct. Collectivism is wrong. It allows the worst of people to live in a state of mediocrity. This popular video of the New York Public worker wrecking a car on a snowy street is a perfect example of what you get when you allow people to live in that state of mediocrity. This is your typical union employee. And I say that from lots of experience. Don’t ever ask me to pay for people like this with tax dollars. Previous Post “B” Day is Coming!!!!!! Lakota’s dreaded busing cuts! Well they are making sure they are out in the open now. The guy said his name was Mark. Obviously a ficticious name. So glad you are able to expose the lot of them. SEIU, AFT, NEA, and the lot are all part of the overhall of our system. The unions have a history of making sure they get the money and power and to heck with the rest of the people. History keeps repeating itself and the people never learn. Great site. A lot of helpful information here. I’m sending it to several friends ans additionally sharing in delicious. And naturally, thank you for your sweat!